Human population has been ratcheting up and so is the case with pests. Rodents, bed bugs, fleas, termites, aphids have literally grown to proportions of supercolonies. Studies estimate that global warming could lead to this boom in insect population specifically pests. The rapid and uncontrollable growth of pest population, in turn, can trigger health hazards in the form of various diseases in which the pests act as carriers. Wild rodents were responsible for the deadliest epidemic in human history known as the Black Death, which wiped out an estimated 60 percent of the population in Europe during the middle ages. A rising pest population is a menace and if left uncontrolled can severely affect agricultural production, which remains the backbone of every economy. Controlling pests has thus become a priority in both urban and rural areas. Numerous professional pest control services have thrived under this increasing demand for eliminating pests of all kinds. There is an expansion in the market for pest control services, which make now the perfect time if you wish to start a pest control service. According to a study by Markets and Markets, the pest control market in 2015 was valued at about USD 16 billion. It is projected to reach about USD 22 billion by 2021 at a CAGR of 5.3 percent from 2016. The study clearly states that the amount of pest control services will grow and saturate the market, which will lead to increased competition between these services. With the increase in competition, you will be presented with the challenge of making your service unique and efficient from the rest. But how can you implement changes to make your pest control service stand out from your competitors? Apart from the core service that is been offered, the other way to add something distinct from your rivalries is how you manage your customers. Customer management has become a priority in almost every field of business. Creating good relationships with the customers and reaching out to them faster than anyone is the goal of every service oriented business. And this is where marketing occupies a pivotal role. Conventional pest control services relied on word of mouth marketing which is a common and effective method. However, when the location and scale of your service availability keeps on expanding, word of mouth seems inadequate to deal with this. Out of all the ways you can market your pest control service, internet marketing is the preferred option considering the immense growth of the web today. People look for information related to a service mainly in the web via search engines. By using internet marketing, you can better reach out to potential customers and grow your business. Entering into the World of Internet. By entering your service into the internet, the possibilities in terms of reaching out, maintaining existing customers and making good relationships with the customers can be limitless. There are many ways you can do that such as by a website, business listing, social media, mobile application and so much more. While traditional marketing used TV, radio and other forms of electronic communications, internet marketing can be defined through search engine optimization, social media marketing, internet advertising, etc. The following are some of the vital steps to enter your business into digital marketing. Getting your business online can be started by building a website. With the availability of several internet hosting services such as WordPress, it is easier for you to create a professional website by paying a certain amount. While building the site, it is important to ensure that you have included all the details like contact information and other contents. After you have built your company website, the next thing to do is to list on a major search engine like Google. You need to add your service in Google in order for it to be listed in the search engine results. For this, log into the Google My Business website and enter all the necessary details like name of your company, address, mobile number, email, timing, website, etc. One thing to be noted is, even though you have listed the company, it doesn’t mean customers would choose you over others. Customers would always look into the ratings being given for each service. And companies with good ratings always stand out from the competition. Requesting the customers to rate and review your service is one way to increase the reputation of your service. SEO is the method of generating traffic to your website from the search results on search engines. It is mostly based on contents of your website. You can think of all the possible ways to inform and educate the customers in order to build trust. You can include contents on precautionary measures when the infestation has been identified including the reasons for infestations and so on. All this will provide you with some authority over other competitors in the industry, which gives the customers a solid reason to opt for your service. Moreover, all the relevant keywords that you use on your website will help your website to reach out to new prospective customers. You all are aware of the power of social media in influencing people across the world. It is a platform where people connect to each other and share information regarding almost anything. As mentioned earlier, pest control businesses used word of mouth way of marketing. Social Media can be used in this manner as a digitalized way of word of mouth marketing. Facebook, Google+, Yelp, etc. are some of the major social media platforms. By building a reputable presence of your business in different social media platforms, you can increase the potential to attract more customers. There are rating features in many of these social media networks just like Google My Business ratings. Make sure you collect reviews and ratings from the customers, which will further help to build more trust and reputation for your business. Internet advertising can be done in search engine pages as well as via social media platforms. Google AdWords is Google’s advertising platform and the largest in the world. The most effective way to advertise your service is through search ads. Search ads are those which can be seen when people look for the services that you offer. By targeting specific keywords like ‘Pest control services’, ‘Pest control business’ or ‘Pest control companies’, the ad will become visible when people search for these keywords in the search engine. You can also use Facebook Ads to advertise on the Facebook platform. Another way to advertise your business is through Pay-per-click or PPC. It is a form of online advertising where you create ads above the google searches and pay only when users click on those ads. 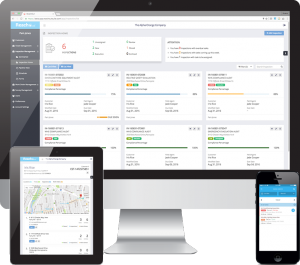 The inclusion of a utility mobile app that can automate your field service including pest control can be a real asset. Mobile applications makes it more convenient for you to manage customers and their requirements. These applications take over the entire process of field service and pest control management to maximize performance, productivity and speed. 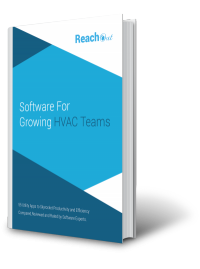 ReachOut is an effective field service management app, which can be downloaded and used for managing the service. The field personnel can use the app to view their scheduled assignments. The managers can then assign tasks online to field technicians using the app. Having an application like this will surely increase your service productivity and manage the work efficiently keeping customer satisfaction at the forefront. Succeeding in your business efforts is largely dependent on following the latest technological trends. Having a better delivery model combined with the expertise of a skilled marketing team can create true value in your business. The exponential growth of the internet and mobile technologies means that leveraging them could turn the tides to your advantage. Besides, with the whole world getting connected, utilizing these technologies can actually help deliver your services to the customers in a more effective way. The emergence of field service software and mobile apps could be of valuable assistance for managing the daily work and customers. The use of a mobile app in your regular pest control operations will help streamline the process, eliminate cumbersome paperwork and reach out to the customers directly. And with more business opting for the internet to spearhead their marketing efforts it is better to direct the processes in its favor. So, for every business or service out there who haven’t entered into internet marketing, it is never too late to market yourself on the internet and never be late to do so.